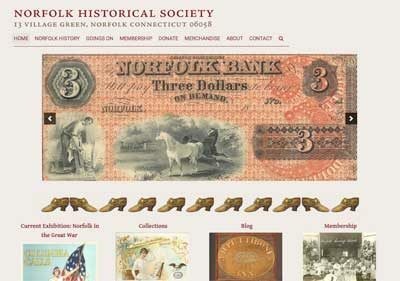 The director of the Norfolk Historical Society museum had a website problem. Their website was difficult to update and it wasn’t performing well on Google Search. A quick review of the WordPress site turned up a few problems. The original theme was not mobile responsive, meaning the site would be hard to view on a phone, and not rank as well on Google Search. The site had an e-commerce store, but it was separate from membership, and there wasn’t a way to make an online donation to the museum. The goals of this project were to make the site mobile-responsive, easy to update, and search engine optimized (SEO). Since the site was built in WordPress it was an easy matter to build a new theme that was mobile responsive and WordPress has great tools for SEO. We could also use WooCommerce to tie together the gift shop, membership, and donations. A proposal was written up and accepted and over the course of 5 months, the website was rebuilt tested and launched. The new site is now much easier to update and all of the e-commerce transactions are in one place. The website now ranks better on Google search. © Copyright 2009-18. All rights reserved.